A caregiver refers to anyone in whom a near-death experiencer (NDEr) confides about their NDE. The first caregiver to whom most NDErs turn is a medical professional who is nearby within moments, hours, or days of the NDE. Other caregivers include family, friends, and anyone else to whom the NDEr discloses their experience. Usually, the first discussion of an NDE plays an important role in the course of the NDErs integration process—a process that research 1 has shown can take years. The following suggestions are offered to help caregivers provide NDErs with the chance to discuss the experience as soon as they are ready and to set out on a constructive course of integration. To be most helpful to NDErs, caregivers need accurate information, a helpful attitude, and specific skills. About 4 out of 5 people who survive a close brush with death report they remember nothing unusual, and about 1 out of 5 report they remember an NDE. NDEs occur in a variety of situations, including actual clinical death or situations involving medical procedure, severe illness, injury, accident, or suicide attempt in which death is occurring, is imminent, or is possible, or in which the person believes they are about to die or are dying. The content of most NDEs ranges from pleasant to blissful, including such common elements as an out-of-body experience, movement through a tunnel or void, encountering deceased loved ones and supernatural beings, and a life review. The content of some NDEs ranges from mildly to extremely distressing; they can include feelings of guilt, remorse, fear, confusion, or resistance; profound isolation; or, most rarely, hellish settings. In the aftermath of a near-death situation, it is not currently known why most people report no NDE, a minority report pleasurable NDEs, and an even smaller number report distressing NDEs. Immediate reactions to NDEs can range from "no big deal" to intense preoccupation. Long-term effects of NDEs typically involve mild to extreme changes in personal beliefs, attitudes, values, goals, behavior, relationships, (or interaction with others), and sense of spirituality. Establishing and keeping this attitude often calls for the caregiver to put aside personal beliefs and values in order to honor and foster the NDEr's development of his or her own beliefs and values. Prior to any known situation in which an NDE might occur, such as a medical procedure, the caregiver volunteers the reassurance that, "At any time around your procedure, I'm interested to know anything you're experiencing. You can feel free to tell me anything you want to." After any situation in which an NDE might have occurred, the caregiver volunteers the information that, "Sometimes when people have been through [the situation the person has been through], they describe unusual or sometimes even weird memories or experiences. I wonder whether you have a memory or had an experience like that." If the person looks quizzical or uncertain, the caregiver reflects, "It looks like you don't have any memory of anything unusual," and then moves on to a topic of relevance to the person. If the person responds with any level of recognition, the caregiver reflects, "I'm interested in hearing anything you want to tell me about what you remember." Open-ended questions that can't be answered by yes or no and that encourage more detail ("And what happened next?"). When the person has described the actual experience as much as they want to, the caregiver asks, "What does the experience mean to you?" or "What do you make of all that?" and reflects the person's answer. The caregiver evaluates the person's level of need for further help. If the person seems satisfied to have discussed their experience to this extent, the caregiver offers, "If you would like to talk more about this again, or if you'd like information about others who've had experiences similar to yours, let me know." For more info, the caregiver can refer the NDEr to the IANDS website, www.iands.org. 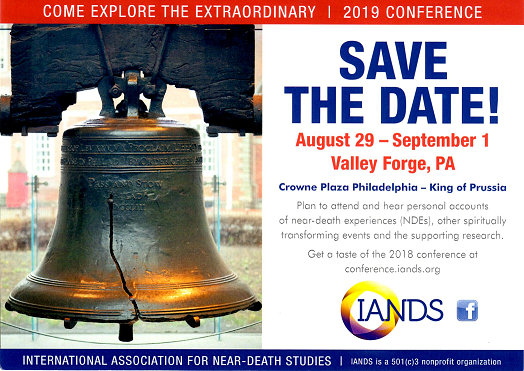 Resources incluce social support, contact information for the IANDS group meetings, articles on NDE-related topics, an Introductory Bibliography of Near-Death Experiences, recommended readings, and a list of audio and video presentations from IANDS conferences. If you are trying to find a counselor or other mental health professional, you can contact the American Center for the Inegration of Spiritually Transformative Experiences, at www.aciste.org NDErs who want information about how to choose a psychotherapist can consult the Experiencers' Guide to Psychotherapy, available at www.iands.org/support. Greyson, B. "The near-death experience as transpersonal crisis." pp. 302-315 in Scotton, B. W., Chinen, A., & Barrista, J. R. (Eds.) (1996). Textbook of transpersonal psychiatry and psychology. New York: Basic Books. Greyson, B. (1997). "The near-death experience as a focus of clinical attention." Journal of Nervous and Mental Disease 185, pp. 327-334. Greyson, B. & Harris, B. (1987). "Clinical approaches to the near-death experience." Anabiosis 6, pp. 41-52. The caregiver who would like to do in-depth reading on specific NDE-related topics may purchase the Near-Death Experiences Research Bibliography. This bibliography enables the user to generate a citations list of every Anabiosis and Journal of Near-Death Studies article published through 2001 that addressed a particular topic related to NDEs, and, if desired, purchase reprints of the listed citations from the IANDS office. Caregivers with other questions not answered in this brochure may also contact the IANDS office. van Lommel, P., van Wees, R., Meyers, V., & Elfferich, I. (2001). "Near-Death Experience in Survivors of Cardiac Arrest: A Prospective Study in the Netherlands". The Lancet 358, pp. 2039-2045. Greyson, B. "Near-death experiences" in Cardeña, E., Lynn, S. J., & Krippner, S. (Eds.) (2000). Varieties of Anomalous Experience: Examining the Scientific Evidence. Washington, DC: American Psychological Association.